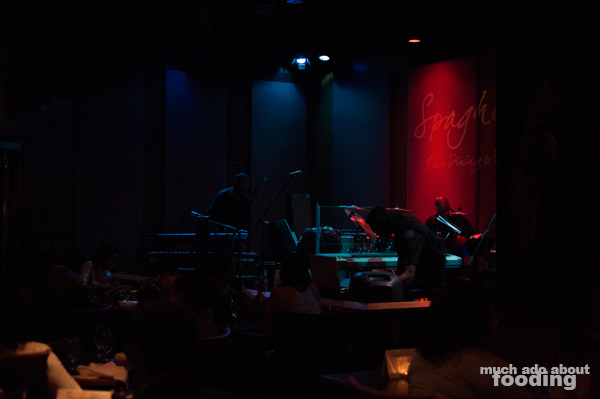 Seal Beach has been home to Spaghettini since 1988, the creation of founders/owners Cary Hardwick and Laurie Sisneros, and soon, Beverly Hills will be graced with the same concept with a stronger emphasis on the musical entertainment component. 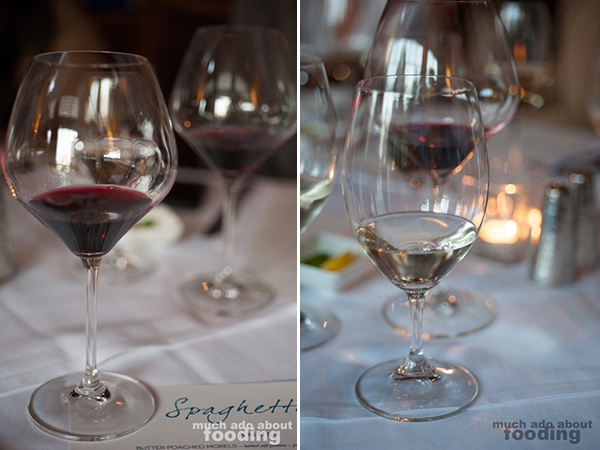 Spahettini itself has already become well-known for its fresh Californian riffs on Italian cuisine and its inclusion of live musical performances in one of the main dining rooms. 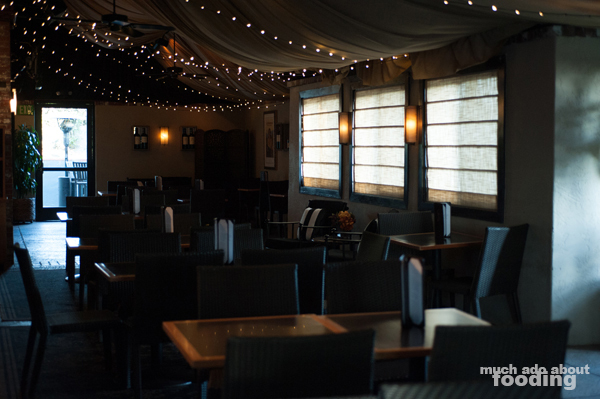 Though preparing for their second location, they are still keeping their Seal Beach original extremely popular with their masterful and innovative menu. When we dined during a tasting, the restaurant was quite full despite it only being a Wednesday night. What we tasted confirmed why it was such a hot spot. The main attractions of the space may be the dining rooms and the proximity to the jazzy stage but don't discount the outdoor patio. Lounge furniture and a firepit frame the building for a cocktail hour section and there, we munched on bite-sized Ahi Tuna Crisps with heirloom tomatoes from Yolo County and goat cheese with basil, , Shrimp with Parmigiano-Reggiano on phyllo dough, and Burrata with peaches and 16-year-aged balsamic vinegar reduction. Bright and refreshing, each of these canapés were an introduction to the care and preparation of the chefs in the Spaghettini kitchen. 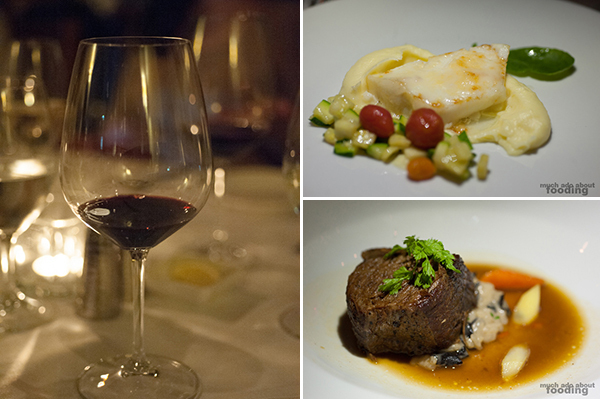 These previews into the talents of Executive Chef Victor Avila, who has been with the restaurant for 23 years and the executive chef for 10 of those years, were quite promising. 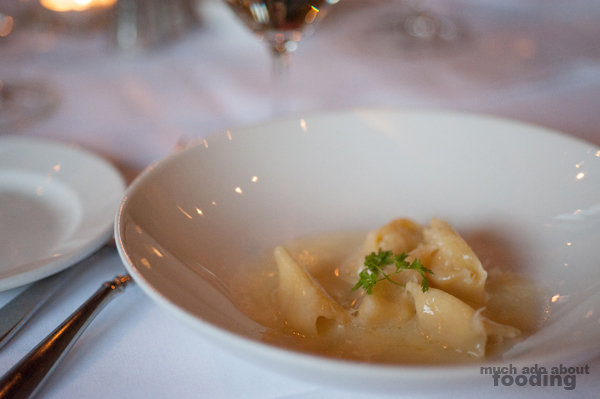 The evening begun with Spaghettini's amuse bouche - Butter Poached Morels. To say that I like mushrooms would be an understatement so upon seeing this bite listed out, I hoped not to be disappointed. 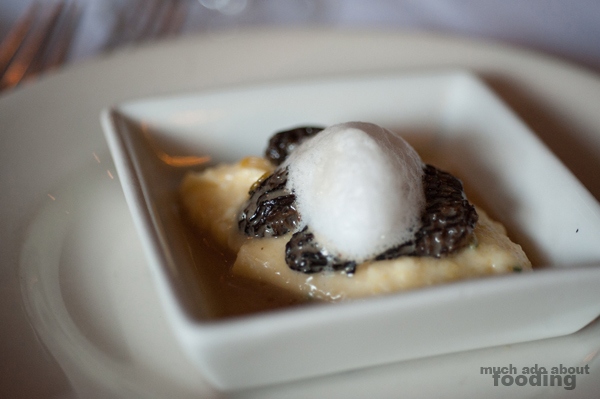 Served with an herbed soft polenta, prosciutto jus, and Parmigiano Reggiano foam, the morels were mesmerizing. I tasted the hint of zest in the polenta which was so soft as to be almost a thick cream and the prosciutto jus lent a saltiness that dipped into the crevasses of the wild mushrooms so intimately. The airiness of a cheese-inflicted foam not only impressed but piqued my curiosity - how can I make this for myself? This was paired with a 2012 Barbera d'Asti by Prunotto Fiulot and was a confirmation of the promise the appetizers suggested earlier on of the chef's skill. 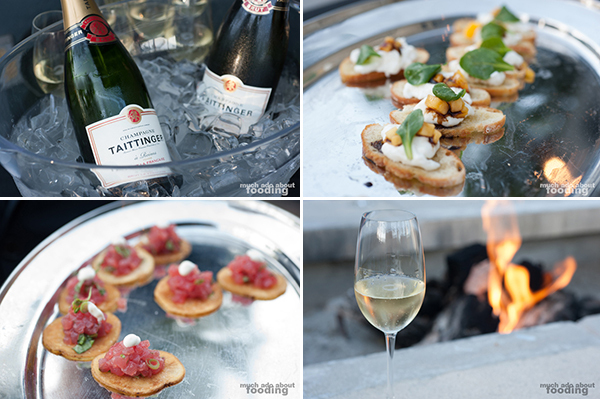 paired with Twomey's (Silver Oak second label) 2013 Sauvignon Blanc. The pasta at Spaghettini is made in-house and fresh every day which was easily detected whether or not they had informed us. With a bite and a springiness to the dough upon each chew, the pasta gave telltale signs of its youth in the kitchen. What I discovered in this that I realized was present in all of the other food so far was that there was always one innovative element to the food that did not detract but rather surprised and tied everything together in a neat bow. In the agnolotti's case, this would be the corn. The burst of sweet, bright flavor relieved the density that pasta usually gives and the sauce was so delectable, I looked like a fool trying to scrape it up with my fork tines. The following two courses were small portions of the popular entrees that Spaghettini diners adored - the Parmesan-crusted Chilean Seabass with a Yukon Gold potato puree, spring squashes and roasted heirloom tomatoes, and lemon buerre blanc and the Braised Short Rib with black trumpet risotto, baby carrots, and jus. 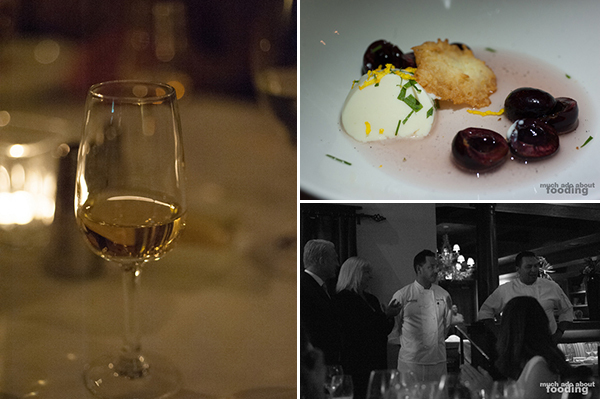 The former was paired with Kistler Vineyards' 2012 Chardonnay and the latter with Cade's 2010 Cabernet Sauvignon. At first, I was unsure that there was a "crust" on the seabass but upon taste, it was apparent that the Parmesan was very subtly dusted and crusted onto the fish during the preparation process, imparting the salty umami while hiding from view. This flaked beautifully with each fork touch but I actually found the most joy in the mix of the potato puree and refreshing buerre blanc. As for the short rib, such a tender meat was easily overshadowed by the excellent composition and strong flavors in the risotto. For both dishes, the proteins were impressive but the stars on each plate were the sides/accompaniments instead. So how to end an enjoyable night at this point? With another dish that also has a creative flair to it. Our dessert was Spaghettini's Coconut Pannacotta, a creamy delicate dish lounging in the jus of Bing cherries and citrus, sparsely garnished with shredded squash blossoms. This came paired with a 2007 Dolce late harvest Semillon and Sauvignon Blanc, a treat of a glass. The taste of coconut in the pannacotta came not from the familiar flavors of dried coconut flesh but from the revitalizing rejuvenation of coconut juice. It was worthy of being lapped up quickly with bites of sweet, ripe cherries in between, giving firmness to the otherwise creaminess of the pannacotta. 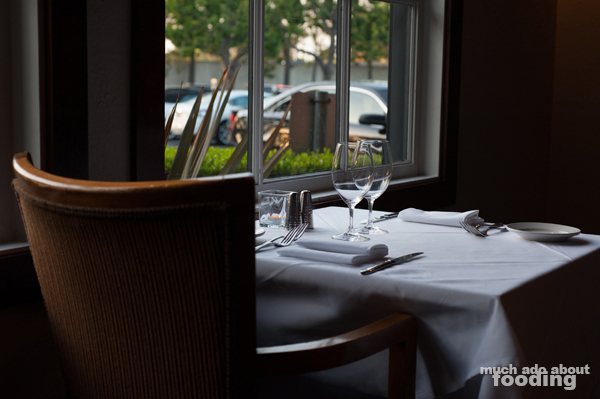 It was in these final bites that I could see why this near-26-year-old restaurant has withstood the test of time in Orange County; they carry their legacy from beginning to end of every meal from amuse bouche to digestif.